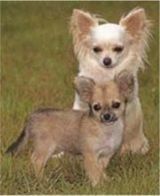 Chihuahua dogs are widely recognised as the smallest dog in the world and Chihuahua puppies are even smaller! They are spirited, intelligent and even tempered. They adore human companionship but need careful handling because of their small size. Chihuahuas and Chihuahua puppies like children and other pets, however they can easily be treated mistakenly as 'toys' and be seriously harmed in rough play. 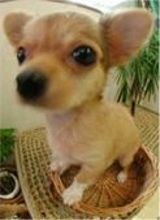 Most reputable breeders would recommend 'adopting' Chihuahua puppies between the ages of 4 and 12 months when they are a little more agile and not so prone to injury. Chihuahua puppies are eager to learn, although they are not usually trained due to their tiny size. Chihuahua puppies come with two coat types, long and close – they require grooming and regular claw trims, also dental check to keep an eye on tartar build up. They have been around for several hundred years, although their exact origin is disputed. American tourists brought specimens in the mid 1800's – and subsequently this little dog became one of the most popular breeds in North America. 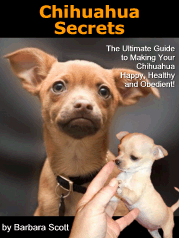 Chihuahua puppies are not usually trained due to their tiny size, but are keen to please!